From the start The Immigration Lawyer: Asylum made an impression, weaving a complicated tale of a fight for a better future and a fight for equality. 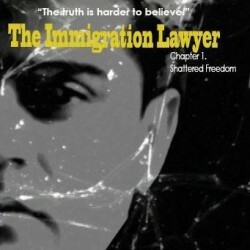 The novel manages to hook you with a very present political and social hotbed issue of immigration, presenting a truly fascinating glimpse into immigration law and what many immigration lawyers have to go up against every day to help their clients get the chance at a better life. The novel has a heartfelt and emotion rich subject that explores the uphill battle lawyers face as they try to breakdown the walls of injustice and inequality, bringing hope to those who come to America for asylum, immigration and more. Mr. Peerally really captures the intricate web of laws, rules and regulations as well as the tireless hoops that lawyers must jump through to traverse the immigration system. The novel doesn't shy away from the brutal truth, highlighting the problems that are all too often found in this system from prejudice to corruption and everything in between. This is an engaging novel that runs the gamut of emotions and offers readers a look at the immigration system and just how people like Ahmad suffer simply for who they are and their wish to come to this country for a brighter future.